Pink, flowers, frills, salad. Which one of these doesn't belong? For some reason we always attribute salad as a feminine dish. It shouldn't be. Granted, you don't want to go on your first date with a guy and have him order just a salad. 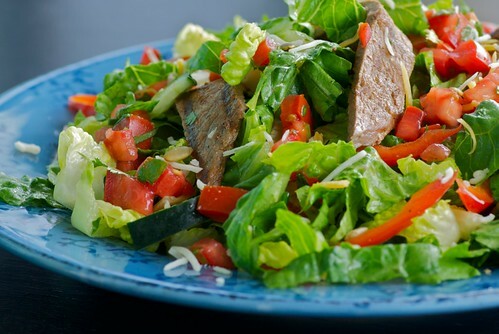 That would be weird, unless it's a "man salad" like this carne asada salad made with steak. You see, a "man's salad" must have at least one muscular protein such as bacon or steak; seafood is allowed only if it's blackened or grilled; sorry, no exceptions. It must have lots of manly, that is, tasty, hi-cal toppings, such as cheese, avocado, tortilla chips, and diced ham. Dressings must be full-fat and creamy like ranch or blue cheese; if it's a vinaigrette, make sure it's spicy and has some heat. Hey, I don't make the rules, I just report them. How about you? Got any manly salads that your guy likes and isn't embarrassed to eat? Don't worry. The ingredient list is long, but this Mexican salad is easy to make. For a speedier version, buy marinated carne asada which is available at Mexican speciality markets and most major supermarkets. You can also use bottled salsa in place of the homemade pico de gallo. 1. In a small bowl, combine marinade ingredients. Place steak in a Ziploc bag or tightly covered dish and cover with marinade, turning until coated. Marinate in refrigerator for a minimum of 1 hour or up to 4 hours. 2. For the pico de gallo, combine all ingredients in a small bowl; toss well and set aside. The earlier you make this, the more flavorful it will be. 3. For the vinaigrette, whisk all ingredients in a small bowl and set aside. For the salad, combine all ingredients in a large bowl. 4. Before cooking the steak, let it rest on the counter for 10 minutes. Preheat grill to medium-high. If you don't have a grill, then use a grill pan on the stovetop or other large, heavy bottomed pan over high heat. Grill the steak for 2 to 3 minutes per side, until charred on the outside yet still pink and tender on the inside. Let rest for 5 minutes before slicing against the grain. 5. To assemble: Pour vinaigrette over salad and toss well. Divide evenly among four plates. Top each with 1/4 of the steak and 1/4 of the pico de gallo and any other toppings of your choice. Serve immediately. Southwest BBQ Chicken Salad recipe from Mommy, I'm Hungry! Ha! This has me totally laughing because you are so right, there are "salads" and then there are "manly salads" and ne'er the twain shall meet. Yours looks wonderful! What a fantastic summer salad! So good. Now this is a salad my husband could get behind. Especially since he always does the grilling! Thank you for sharing! It does sound man friendly Susan! That looks like a salad that would satisfy even my manly carnivore! I have a Philly Cheese-Steak Salad that's great...with penne pasta and thinly sliced grilled ribeye, medium rare, grated provolone. Think you'd like it. I like the way you refer to the "manly salad" great recipe.